I'm pleased to announce that NYP/Columbia has been named a center of excellence in clinical care for Gastroenterology and GI Surgery by U.S. News and World Report. In this issue we feature our Center for Motility and Neurogastroenterology and our multidisciplinary team's success in helping even the most complex patients. We also have an update from our national leadership in treating all forms of adult liver cancer. 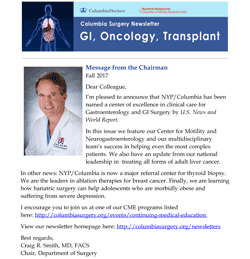 In other news: NYP/Columbia is now a major referral center for thyroid biopsy. We are the leaders in ablation therapies for breast cancer. Finally, we are learning how bariatric surgery can help adolescents who are morbidly obese and suffering from severe depression. I encourage you to join us at one of our CME programs listed here. View our newsletter homepage here.